There’s science, and a little bit of madness, involved in marketing an initial public offering. The entire process is time-bound; then, there’s the thing about having to cope with developments that could range from inclement weather, which cancels a roadshow or press conference, at best to a negative research report or media report trashing the IPO at worst. In some cases, as happened most recently with the IPO of Puravankara Projects Ltd, issues over which the company and its managers have no control can often wreak havoc with carefully laid plans: In this case, a worldwide fall in equity markets, and a dip in the Bombay Stock Exchange’s realty index, translated into weak response for Puravankara’s IPO and the issue eventually had to be repriced and its deadline extended. All this usually happens rapidly: The actual IPO process lasts four days on average and is preceded by a fortnight of high-decibel publicity. The pressures are compounded when several IPOs fight for subscriber money. In June 2007 alone, some Rs19,105 crore worth of IPOs hit the Indian stock market. That can work both ways. In some cases, it could mean smaller issues are ignored; in others, it could mean even smaller issues get oversubscribed because everyone is in a buying frenzy. That’s exactly what happened to the Rs110 crore IPO of Vishal Retail Ltd, which coincided with that of DLF Ltd. The issue was subscribed 81 times. Although Rs26,118 crore worth of IPOs have hit the stock market since April, compared with Rs24,993.37 crore in all of 2006-07, there aren’t too many advertising and marketing specialists fighting it out for a slice of the business. The business is dominated by Concept Public Relations India Pvt. Ltd and the Adfactors Group. The two bundle advertising, public relations, event management and investor relations, and have a reputation for getting the job done. Concept, a Mumbai-based communications and marketing group headed by Vivek Suchanti, marketed 13 of the 35 issues that hit the market in the quarter ended 30 June. Rajesh Chaturvedi and Madan Bahal’s Adfactors Group was a close second, with 10 issues. Together, the two agencies handled 23 of the 35, or 65%, of all IPOs in the first quarter of 2007-08. The two companies did well in 2006-07 too, marketing 68 of the 85 IPOs that hit the stock market that year. Concept managed 33 and Adfactors, 35. That kind of dominance hasn’t made the two companies complacent; they compete for almost every contract, and the rivalry between them is so keen that Suchanti even refuses to refer to Adfactors by name (he calls the company “my competitor"). The duopoly enjoyed by Adfactors and Concept is almost complete. There are two other relatively small but similar companies—Pressman Advertising & Marketing Ltd and Sobhagya Advertising Service—but their share is decreasing steadily. Pressman is owned and managed by Vivek Suchanti’s cousin Navin Suchanti. Vivek Suchanti has parlayed his company’s skills in marketing IPOs to good effect, venturing into merchant banking services with Keynote Capital Ltd, which is run by his brother Vineet Suchanti. Traditional advertising agencies have largely steered clear of this market because tight regulations curtail creativity and have created a parallel world, which is seen as the unconventional part of the advertising world. Besides, IPO marketing forms only a sliver of the overall advertising business. Concept and Adfactors have worked aggressively and furiously to corner the lucrative business of IPO marketing. Their methods are sometimes unconventional. “We leverage relationships with everyone—from publishers to journalists—to create opinions about the IPO," says Suchanti. It is the ability to do this that gives these two agencies an edge in the Rs200-crore IPO segment of the Rs16,000-crore advertising industry. Their tactics include allowing select media analysts a preview of the offering to ensure good positioning, and organizing media trips to plants of the company and meetings with the management. Though IPO advertising accounts for just over 1% of the total advertising business, it remains lucrative. The companies marketing the issue stand to earn as much as 15% of the total ad spend, compared with single-digit commissions for other ad segments. This, of course, includes fees for public relations, media buying and other services, besides advertising fees. This unusual range of services is delivered at breakneck speed because the IPO process is very short and intense. “This is not rocket science, but you have to have a temperament to work 24/7," says Adfactors’ Chaturvedi. “Unlike others, I can’t not take a call in the middle of the night or a weekend." It also requires a wide network. The two agencies have a presence in as many as 30 cities, in which they can organize roadshows at short notice, and maintain relations with the local and vernacular press. The two agencies also have comfortable working relationships with merchant bankers. “If a consumer products company was selling its product, it would rely on a traditional advertising agency. But when it comes to equity, the company usually goes by the experts recommended by merchant bankers," says a marketing executive who marketed IPOs in the 1980s. The executive did not wish to be identified. These specialized requirements are perhaps the reason why these two IPO players focus almost exclusively on this segment. Though Concept and Adfactors offer a range of PR and advertising services, IPOs account for 90% of their revenue. This specialization of Concept and Adfactors has been long in the making. The Suchantis owned Pressman PR, and were among the pioneers of financial advertising. And it was current owner Vivek Suchanti’s father, Nirmal, who broke away from the family business and set up Concept in the early 1990s to cater to IPOs. More recently, Vivek has dabbled in film production, having financed Tujhe Meri Kasam, the debut film of Maharashtra chief minister Vilasrao Deshmukh’s son, Ritesh Deshmukh. But IPO advertising continues to be the mainstay. The Adfactors Group launched about a decade before Concept. Co-founder Chaturvedi, a former national-level hockey player, worked as an assistant to Ramnath Goenka, founder of The Indian Express Group. 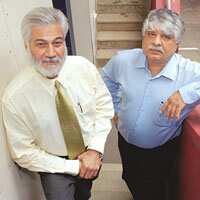 Chaturvedi started the PR company with friend Madan Bahal in 1982. Initially, the agency focused on financial advertising and PR, but the duo decided to concentrate on IPOs during the stock market bull run in the 1990s. The narrow focus of these two agencies is not something large advertising agencies would like to replicate. “This is not something we would consciously go after, as IPO advertising is just a small percentage of the industry right now," says Pratap Bose, chief executive, Ogilvy and Mather Ltd, which is among the largest advertising agencies in India and is a part of the WPP Group. Bose, whose agency dismantled its financial advertising arm a few years ago, however does not rule out a return. “If it (IPO advertising) were to grow to a substantial size in the future, then we might look at it," he adds. Growth in IPO marketing is something the smaller players are not betting on. “This is a dynamic business. The IPO business is cyclical in nature and contracts. The market could increase or contract to nothing," says Sangita Irani, president, Sobhagya Advertising Service Ltd. Her company was among the largest IPO marketers along with Pressman (Concept’s parent company) not too long ago. In 2004-05, Sobhagya was among the top two marketers of IPOs in India, according to Prime Database, which is operated by Praxis. It marketed ICICI Bank’s last issue in December 2005 but lost out on marketing the June issue to Adfactors. A lot of money is at stake in marketing an IPO, explains a senior advertising agency executive who did not wish to be identified. “The IPO is so important that the people behind it will resort to just about anything and do whatever it takes to make it successful," he says. Such efforts sometimes fall foul of the regulator, the Securities and Exchange Board of India (Sebi). For instance, Sebi recently asked several companies, which had floated IPOs, to explain rumours in the market that could potentially have helped their issues. The companies were forced to put out ads saying they had nothing to do with these rumours. The success of Concept and Adfactors, however, is heavily dependent on the market. Competing communications agencies are quick to point out that while the IPO boom has triggered a dream run for them, a slowdown in the stock market could change things dramatically. Surprisingly, despite the IPO boom, few new agencies have entered the business. “The reason we see few new players in this area is primarily because creative agencies have not made the effort," says O&M’s Bose. “Or, maybe (it is because) the competition is really good," he adds.